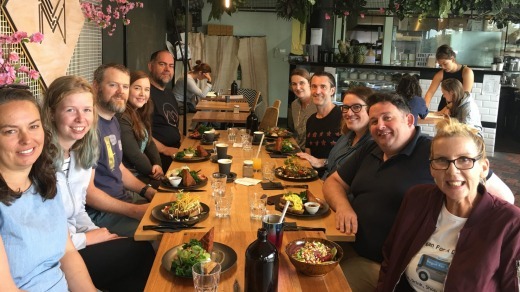 "I love food so much, I love showing people how good it is," says Ginger Scott, as our group is driven through Melbourne's popular bayside neighbourhood of St Kilda. Scott's our guide on a Melbourne food tour, but it's more specific than most. Vegan for a Day is a round-up of meat-free establishments, in a city famous for its surge towards plant-based dining. One of the local stars of that scene is Matcha Mylkbar, our first stop. On a busy corner with a view of Luna Park, this is not your old-fashioned vegetarian establishment serving lentil curry. 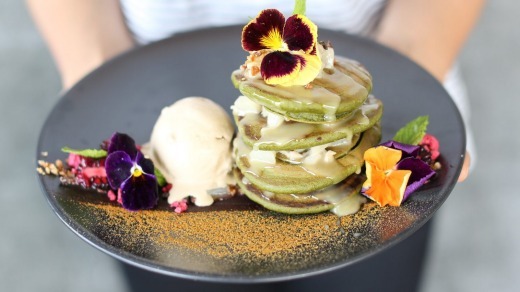 The menu lists innovative dishes including yuzu smashed avocado, matcha pancakes and a purple peanut butter latte. I try Matcha's big breakfast featuring its trademark "poached eggs" with a curried sweet potato filling that's not much like egg yolk but tastes great nonetheless. "My aim is to show visitors how amazing our vegan scene is here," says Scott, as we eat and chat. "And how easy it is to be vegan." On today's tour there are vegans and vegetarians, but also some curious carnivores and mostly-vego "flexitarians" like me. For travellers the tour has a double benefit: identifying not only meat-free eateries but also exploring beyond the usual tourist haunts. Crossing the Yarra River to the inner-northern suburb of Fitzroy, we enter vegan heaven. 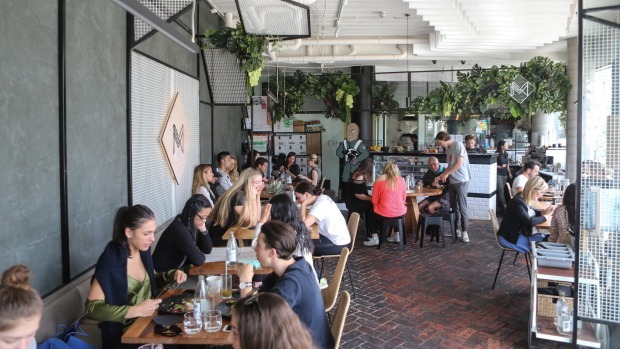 On Brunswick Street plant-based eateries are plentiful and we also find a number of stores which sell animal-free products including footwear, handbags and other accessories, some from well-known brands. Lunch is at Vietnamese restaurant Fina's Fitzroy. It has the vibe of any local Asian eatery – friendly staff, floral decor, photos of the dishes on the walls – but the food is entirely meat-less. There are pages of noodle dishes, clay pots and hot pots, along with entrees along the lines of mock crispy chicken. I order the laksa which includes fried tofu among the usual noodles and spices. Back on the bus, the commentary flows as we head to Melbourne's west. Although Scott, an experienced chef, is a passionate advocate for her cause, she's enthusiastic rather than strident as she tosses out facts and figures. An unexpected but enjoyable aspect of this tour is the conversation among the participants. Our group, which is not exclusively vegan, trade stories, restaurant recommendations and cooking tips with an openness that's friendly and refreshing. The most interesting location on the tour is also the most hidden, located in the back streets of Altona within a decaying shopping strip. The Sibling Vegan Bottle Shop stocks wine made without using animal-based products which are often employed in the filtration process. The Iranian-born owner is a big fan of Besos de Oro, a dairy-free cream liqueur from Spain, and serves us tastings of it blended with an Icelandic vodka. 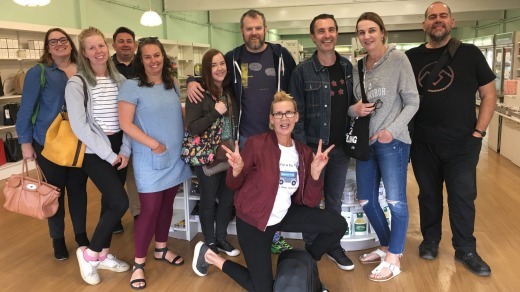 The tour ends at Ascot Vale vegan hub Mister Nice Guy's Bakeshop. Egg-free pastries and a range of visually impressive "monster shakes" sans dairy are drawcards here. As I eat my cinnamon roll, I reflect on the store's retro green decor and its shelf of old-school kitchen canisters. It's a cheerful place that feels like it has links with the past, but also the future. Tim Richards was a guest of Visit Victoria.